This one's from the archives - as good as ever - and with new, pretty pictures. It's one of my most popular posts, so if you haven't tried this recipe, it's a good one to start with! Plus, check out the comments for some great tips - if you have sensitive skin, or allergies. "Best ever" - I know, this is a big claim! And for such a simple, natural product ... but you are going to love, love, love this one! 1. Mix together all the cream ingredients, poking a hole in the vitamin E capsules and squeezing out the contents. Put into a small jar. 2. Put all the dry ingredients straight into a small jar and shake to mix. ... but saying that, this product doesn't cause funny marks on clothes, it doesn't smell strongly, and it really works for a whole day or more! How does it work? Well, these ingredients have antibacterial and antifungal properties and/or absorb moisture. And the cream helps hold the powder onto your skin. Clever, eh? I wish I could say I invented this ... I actually found the recipe on a forum long ago (but sadly have lost the link ... ) Ah, well. Share the love, right? NOTE: You can use either the powder OR the cream if you want, but you get the best-working product from both. And, the powder is an excellent shoe deodoriser!! When I started buying organic-y deodorants, I was shocked at how expensive they were - $9 for a roll on? Ouch! I used organic ingredients here when I could ... and check this out - refined organic coconut oil (I had some non-virgin stuff to use up): $0.75. Tea tree oil: $0.20 (it is so hard to guessimate essential oils!). Vitamin E capsules: $0.10. Baking soda: $0.40. Cornstarch: $0.50. Organic bay leaves: dried myself from the markets ages ago ... $0.20. All in all? $2.15, for 2 people, for at least a month. Good stuff! Aluminium (or aluminum for Americans) is a common and controversial ingredient in many store-bought antiperspirant/deodorants. Ok, so this has been a popular issue in the media of late ... particularly because so many women get breast lumps in the upper/outer quadrant of the breast (mine included!). But, the reality is that there has been no direct and conclusive link between aluminium and cancer. As science goes, some studies say yes, some say no. In the body, aluminium can act as an estrogen mimic - and estrogen feeds many breast cancers (including the one I had). So, I for one, am taking no chances. Read more about this here or, for a recent scientific publication - here. I know I read not to use aluminium-based antiperspirants while I was pregnant or breastfeeding (or aluminium cookware, for that matter). But I tried to find any sort of reputable article to link to, and failed. Aluminium ingestion in large doses by a pregnant mouse does negatively affect the neuro-development of her fetal offspring, and there is evidence that humans can raise their blood levels of aluminium via eating lots of aluminium-containing antacids (check ingredients!) or using lots of aluminium-containing antiperspirants. For a comprehensive medical article about chemicals (including aluminium) and pregnancy, read here. As a scientist, I know that the way science works is that one study shows this and another shows that. It can be hard to follow sometimes! But as technology and methods and ideas move forward, we get more definitive answers. When it comes to my health, and the chances that breast cancer may or may not come back ... well, I'm not willing to wait for the definitive answer. I'm happy to change these things in my life that I can, like cutting out the use of aluminium. That's just the way I do things. It's up to you to choose for yourself, but I would encourage you most of all to think critically about what you put in and on your bodies. The large companies out there that make the products we use everyday are not always looking out for our best health interests. So Think. Question. And, if you see something you don't like, Change. 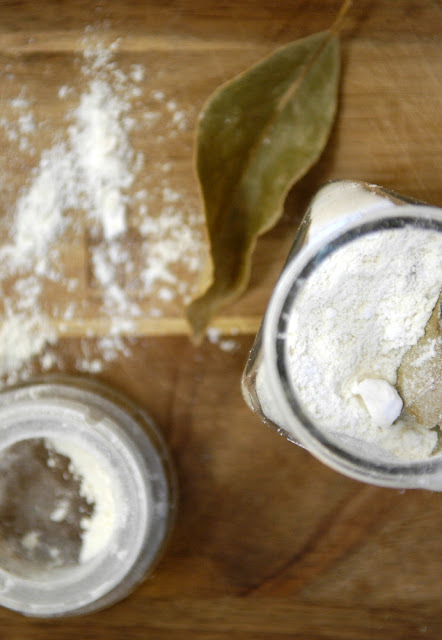 It's easy to be sceptical about make-it-yourself deodorant. But I can truly say that this recipe works better than any commercial deodorant I have ever used. I love it! I used an old makeup powder brush to puff on the powder, and a swizzle stick to stir up the cream if it sets a little in cooler months. Thanks for sharing! Thank you! Sounds awesome, I look forward to giving it a go! I've been searching online for a washing liquid and realised, you're the lady to ask! I've found most use soap, is this really best & least toxic option??? Cool. I tried yesterday with soap flakes and some Eucalyptus - but the flakes came fragranced so not very "pure". Will try castile soap. I have recently just made this, and although I've only been using it for a little under a week, it is AWESOME! I even have little berenberg jars of it in my back pack for when I have a shower at my Mum's after gym once a week. I thought the tea tree oil would be a too strong a scent, but the coconut smell balances it beautifully. THANK YOU!!! I Love your blog, you give me such inspiration to try new things and dare to not be the "norm" (what ever that is lol). Beck, I was just going to ask - what should you do if you travel? I'm always on the lookout for travel versions of my homemade beauty supplies. When I travel, my toiletry pouch is STUFFED and HEAVY! But what are berenberg jars? Honestly this works. I seriously was sitting at work and I was like... You know what. . . I haven't sweat at all today! I didn't use the Cream yet. just the powder this morning. Does anyone use any diff. oil that Vit. E? I have Evening Primrose. Can I use that? FINALLY i have been looking for a good natural alternative! I tend to react to the scents in dove, secret, and many others. my soldier has to have unscented everything. This seems like a great alternative. Where can I purchase the coconut oil? I would like to buy enough to make some homemade soap to. thanks! I'm been researching recipes and I have to say, I'm very excited about trying this homemade alternative. I've used the crystal for years but there are times it works better than not and makes me self-conscious. I'm curious as well, what is a berenberg jar that Beck mentioned in the post above? Hi - you should be able to find coconut oil at any natural food store and lots of grocery stores ... but for large quantities try online! I know here in Australia there are soap supply places/organic wholesalers you can buy from. I love the idea of DYI deodorant but I'm allergic to coconut and tea tree. Are there any recipe variations that don't include those two ingredients? Here is a diy deodorant that doesn't contain coconut oil or tea tree oil. Does this create powdery looking underarms? Just want to make sure I can wear my tank tops without having to worry about having powdery looking arms. Allergic to coconut and tea tree ... I'd try lavender. It's more 'sensitive' than a lot of the essential oils but still has anti-microbial properties. Let me know if it works! Was so excited to try this out, but find that the baking soda turns my underarms all red and itchy. Is there a good alternative out there to the baking soda for those of us with sensitive skin? Thank you for this recipe! I'm very glad to have found a replacement for usual deodorants. When it comes to sweating, I find that it works for me just as good as my favourite commercial antipersirants did, or even slightly better. If I do sweat under stress, it seems that things get back to normal & almost dry pretty soon. And I'd say I have pretty high antiperspirant needs. When it comes to smells, it's surely better! At the end of the day I can't smell anything on my clothes, except for perhaps a very very faint cocnut oil aroma (which I do not mind at all). oh, how very very very great. i've been a bit afraid of regular deodorant for a while now. i have been using the aussie made tea tree one but i could love to make my own - it would go pretty well with my beauty routine of washing m hair with bicarb and my face with organic honey! oh yeh skip the supermarket altogether! I was just at Perfect Potion today and was told there is 100 drops of essential oil to 5mls so that might help you guesstimate the cost? Crunchy Betty suggests using Arrowroot Powder instead of corn starch. Can I substitute that in this recipe as well? If you mix the ingredients and whip with a fork you will get a body butter consistency, it does not get hard in the winter or liquefy in the heat. Also, I have heard you should use arrowroot instead of cornstarch because cornstarch can cause yeast infections. Hi there. I just wanted to ask if it's alright if I don't add in tea tree oil? I don't have access to it right now since the store near me is out of stock. Nika - sure! sometimes I add lavender essential oil instead ... smells super pretty! Hi Amanda, Thanks so much for this recipe. I made a batch this morning and am trying it out for the first time. I don't have tea tree oil (or any essential oils), so left that ingredient out. Is the oil basically for scent, or does it serve another purpose? I would like to thank you for this so useful post. Since I stopped antiperspirants with aluminium, I was very embarrassed by the odors. I tried your recipe and I have to say that I love your powder. For the cream, here in my town, I can't find vitamin E capsules, so I replace by borage oil. But I prefer the powder, so it isn't a problem. I'm very intrigued, but I can't stand the smell of coconut. Can you suggest any alternatives? Thanks! @BlueCat Yay! happy you liked it! Hi, I found you on through pinterest and I have been reading recipes for different diy soaps, scrubs, cleaners, etc... and I am really interested in starting to make my own. But your deodorant one is the first one that I have seen and it really got my attention. I live in Phoenix and have to use a lot and I do mean a lot of deodorant, I put it on at least 2 times a day and most days 3. I have not talked to my dr but I am getting knotts under my arms and I think the the excessive use of deodorant is to blame, so I am wanting to make my own so that I know what is in it. My question is do you think that it will work well in our high temps. If you can write back soon I would really appreciate it. Thank you. @Anonymous Absolutely! We live in the subtropics of Queensland, and it works here ... I've also used it in Phoenix, where my husband works sometimes. Success! (By the way, I've always been a big sweater. Till this stuff.) Saying that, I sometimes switch to lavender oil for a week or so because my body seems to grow accustomed to one deodorant after a few months' use. But then I go right back! (After I've tricked the bacteria, haha). Interesting how 'things' happen. Have had problems with deodorant since teens... close to 70 now and just recently came across a recipe of 4 Tablespoons Virgin Coconut oil and 20 drops of Lavender oil which is working amazingly well. I smell the Lavender when I walk into the bathroom, but not after application to my underarm... no smell of anything at all. Anyway and now I find your blog, with all kinds of information and options. So my question... I do not want to use Tea-tree oil just because I use it for so many other things... a few drops in laundry, foot-soak, etc. Is there another oil I can alternate with Lavender? Thanks, love this blog! This is an awesome recipe! Unfortunately, I am really sensitive to essential oils, and find that they usually cause rashes (I also don't have the funds to experiment with different types!). For the antibacterial aspect, is there anything else I could use like honey or the like? Hmmm ... good idea but not sure how the stickiness of the honey would go. You could try steeping some chamomile or lavender flowers in the coconut oil for a few days (or a week) before straining them out and using the oil in the recipe. Coconut oil in and of itself is anti-bacterial (really, it's anti-microbial, so just about anything/everything is covered there), so you can skip the EO altogether. I would encourage you to find some therapeutic grade EOs, though - something that says it's okay to take internally is safe. If it says "do not use internally," DON'T DO IT. The manufacturer knows what they dilute their oils with and know that it's not safe for human consumption. But here's the kicker - your skin is the biggest organ your body has, and whatever you put on your skin becomes "taken internally," b/c your skin absorbs it. So you're probably not reacting to an EO itself, as much as whatever the oil is diluted with. Pure EOs might cause a tiny detox rash for a short while, but there is virtually NO pure, therapeutic grade EO that causes a true allergic reaction. Hi! I'd really like to try this, but I have vitamin E in a bottle, not capsule form. Any idea how many drops I would need, to be the equivalent of the capsules? Hi Anon, lavender oil and tea tree oil both have antiseptic properties, which is what makes the deodorant part of the recipe work so well ... I'll have a think about this, and get back to you. My one suggestion is to make sure you buy aluminum free baking soda, otherwise you may as well use reg. deoderant. @Autumn Thanks, Autumn! One of my favourite blogs - Crunchy Betty - wrote a great post about aluminium and baking soda (link below). It's actually baking *powder* that may or may not have aluminium, but regardless, it's still worth thinking about where the baking soda came from - whether it was mined as-is or produced via a chemical reaction. I'm not against chemistry personally (other than all that organic chem at university, ugh), but I think it's important to know about it. Hi there! Is there any way to just mix it all together in a paste? My husband is sensitive to any sorts of powdery substances, messes with his lungs. Thanks! Are there jars you recommend? How do you apply the cream? @Amanda @ Easy Peasy Organic thank you! Hello. I'm curious regarding the bay leaves. Do you pulverized them or just throw them in whole? 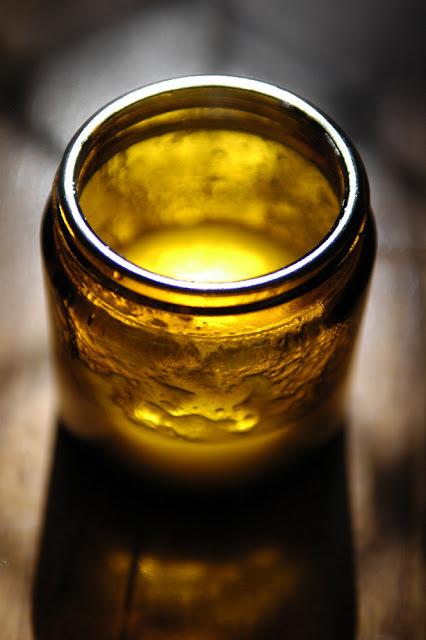 I am experimenting with making a deodorant with raw honey for its anti bacterial properties. Any experience working with honey in a deodorant? I know this comment is coming in late, but hoping Amanda might get an e-mail notification or something! Wondering if there's any way to make this into a "typical" deodorant roll-up bar. I've tried a recipe before where a cream-then-powder process was used, and it was just so messy. How do you apply powder without dumping it everywhere? Also it was messy on my clothes even if I put it on before I got dressed. Just hoping to find a way to make it into a bar, which I much prefer. I saw a comment talked about using shea butter, and just wondered how maybe I could work with that? I've just had a luxurious day with 2 coconuts and this recipe! My hair, skin and hands and pits are so soft and fragrant, it's truly unbelievable! I lived in Hawaii for 3 years, and I was truly missing the smell of coconut for all things heavenly! I've had smelly pits for the last year (nuclear waste bad, even one hour after what I THOUGHT was strong deodorant). The supposed-to-be-baking soda-based deodorant it turns out has Al as the main ingredient, and in fact all 3 brands in the house do, so this was a true revelation, thank you!!! I just made HEAVENLY Hawaiian haupia with my remaining shredded coconut, coconut rice curry with coconut milk, and thai tea (coconut milk on top)! And now my skin feels and smells of the islands...*sigh* happiness! AND...baking powder is practically all aluminum!! Just made this... I've been combining natural clay-based deodorant (Le Stick) with baby powder for a while, but our co-op stopped carrying it, and it was EXPENSIVE! So far, it's great! It's doing better than my other combo. I just apply a little extra powder at night so I don't wake up sticky in hot mornings. I used a combo of lavender and tea tree. Plus, in the powder, I put an ever-so-tiny bit of Valor essential oil in there for good measure (good for my anxiety!). Thanks for this! I have even converted my husband to the dark (er, light side) of nature! Hi Amanda, for the Dry Ingredients instructions is the 5 drops of tea tree oil a mistake, since that is a liquid? I followed the recipe and added it to the powder and it formed cakey clumps where the oil mixed with the powder, and the rest is just powder and what's what I've been dipping my brush in (I apply with a cheap blush brush). Just wanted to check and make sure that was intended. This was my very first DIY deodorant mix and I like it a lot. I find it a bit messy to apply the liquid part (I use my fingers and it gets under my nails) but it works so so well. I don't get stinky armpits for more than a day with a single application! Thank you so much for sharing! Hi, can we use bio-oil instead of the vitamin E capsules? Thanks so much for this! Just made the powder form as I think I am allergic to deodorant all of a sudden. Hoping it works for me! Very glad to have found this page. Thank you.